In our job as videographers, we have many opportunities to travel and to meet as well as collaborate with awesome people and a good example was this save the date video in Malta. Actually, it was one of our most fun projects during our stay in Malta. Such clips are more and more popular, and for good reason: it is an interactive and special way of announcing the big event. In addition, it is a lively memory which you can come back to for years to come and which you can share with your loved ones. Jennifer and Pierre are a couple that loves to travel, and so they don’t miss any occasion to get to know new places and people. Nevertheless, their favourite country remains Malta, the place their birthplace and where they currently live. And since we came to film clips in this magical place, their idea to shoot a save the date video together was a natural and welcome extension to our interests and activities. Malta, European but exotic, with its historical ports and oriental charm, amazed us from the first moment. But from the airport towards our accommodation we didn’t have the time to enjoy the scenery, as driving the English way on the left side of the street turned out to be quite an adventure. The accommodation, offered to us by some Hungarians we met earlier was an excellent option as we basically staid at people we already knew and became friends with. Together we visited the main attractions of the country and, implicitly, the capital. Valletta, despite being the smallest capital in Europe, it has the biggest concentration of historical moments per hectare, according to UNESCO, so it’s a perfect sport for a save the date video in Malta. Therefore, our single problem was choosing which ones to film 😊 So this is a short summary of our week before Jennifer and Pierre contacted us. 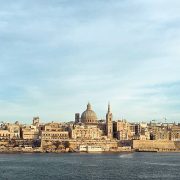 Some of the filmed sequences were on water, on a picturesque ferryboat ride towards Valletta, from Sliema. There, we filmed on the promenade with views to the St Julian’s Bay, a place that blends the charm of a fishing port with classical hotels, traditional restaurants and an esplanade with palm trees. In fact, these towns, along with remarkable churches and serene beaches turn Malta into an attractive spot for destination weddings. Among the particularities that make it so appealing to future brides and grooms are: financially accessible but beautiful venues with amazing scenery, fresh Mediterranean menus and the greatest number of yearly sunny days in Europe. With regard to Jennifer and Pierre’s wedding, from June 2018, the chosen location is Vila Bighi. Initially an administrative building in neo-classical XIX century style, it now hosts events, featuring panoramic views of the Grand Harbor and splendid terraces. As an interesting closing fact, Malta is in the top of the world’s happiest countries, and we have to admit that during our stay there we totally saw why.